Let’s say the digital revolution is over. The enthusiasm that ushered in this revolution has since become counter-balanced, if not submerged, by skepticism and disenchantment. And what we are faced with are ubiquitous surveillance, impoverishment of aesthetic experiences and trivialization of social life, the results of an — at once deep and shallow – immersion in the digital and network media. The way we access, record and archive our presence in the world has also been affected. In this post-digital situation, we all engage in some forms of archiving, whether we want to – or not. When interacting with our devices, we archive and are being archived, held captive by a densely woven net of technologies. How can this condition be approached creatively? 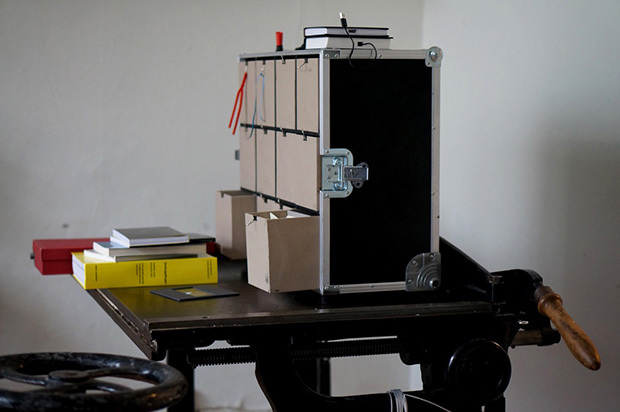 The event takes the form of a temporary zone for the exploration of hybrid modes of personal archiving. In a loose and impromptu manner, the event presents on-going work of several practitioners who, in a poetic, humble, renegade, creative and subversive way combine digital and non-digital techniques to record, erase, archive, unarchive, remediate or demediate selected facets of everyday life in the present moment. The work will be accessible to the public on the evening of Wednesday, September 13th, however individual visits and meetings can be scheduled directly with Jacek Smolicki any time between Thursday, September 14th and Monday, September 18th. Tim Shaw has worked internationally as an artist, performer, sound designer and researcher. His practice is situated within media art and draws upon soundscape and electroacoustic composition, performance making and DIY technology. Collaboration plays a central role in his approach, he has been lucky enough to make artistic work with Chris Watson, John Bowers and Sébastien Piquemal. Shaw has presented work in various venues worldwide including Café OTO, NIME, NK Projekt, ZDB and FACT Liverpool. With rogue data collection by all manner of corporate and state adversaries at an all time high, with hardly a day passing by without a new surveillance program or breach of privacy scheme exposed, the question of how to securely delete data has become all the more pertinent. Software solutions are woefully inadequate if peace of mind is to be achieved in the paranoid hyperscape of all-pervasive mass dragnet surveillance we are all treading in. Eco narratives of renewal and reuse gloss over the fact that these are merely ex post facto potentialities after an initial stage of destruction. The event will instead constitute a tactical, tactile demonstration of the fact that for our digital data to truly become ‘renewable’ it must be liberated from the prison of the physical form, exorcised from the daemon of the hard drive. Nikita Mazurov is Postdoc researcher with the Living Archives project at K3/Malmö University looking at practices of archival protection. In his doctoral work at Cultural Studies/Goldsmiths, University of London Mazurov explored the potentiality of unbridled data dissemination by way of explicating and developing both theoretical (by way of a non-legalist, posthuman hacker methodology) and practical (anti-forensic) techniques of removing any impediments thereto by countering the politics of intellectual properties (malignancies such as copyright/left) and removing forensic watermarks from cultural bodies of work. One of the key questions of the practice of archiving in his current research is how can we help protect those who contribute to archives, thus protecting the archive itself?